To show and perhaps sell my artwork, I bought a canopy with optional sides and signed on as a vendor at the Circle Your Wagons B&B's Annual Wine Tasting event. Don and I set up the canopy top late yesterday to save some setup time. It was a good thing we didn't set up sides, the famed Texas winds started up and blew all night. I had visions of my canopy lifting off and flying away, but since I was at home and 20 miles away, tried not to worry. Thank goodness it was still up when I arrived today. I put on the sides and set up. The wind was still high and blew over the easels so I put 2 of the boards on the ground. 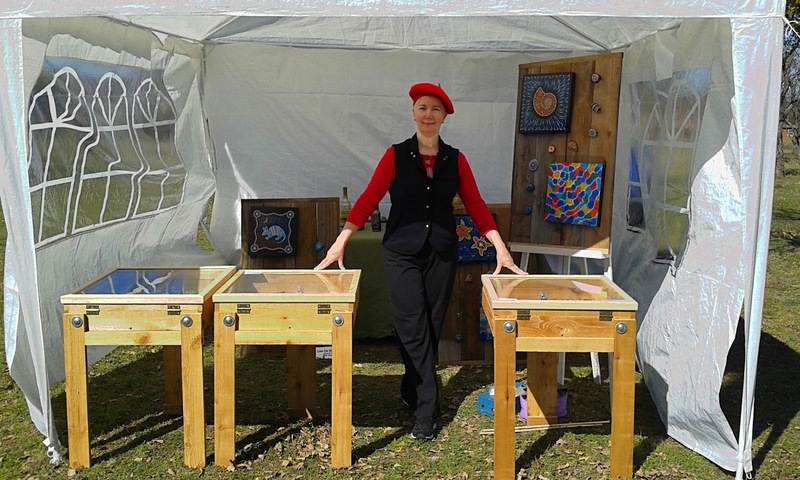 Check out the lovely cases Don made for my painted rocks, glass-topped, easily transported and very attractive! I feel very fortunate, I sold a painting and some rocks. Don came and helped me break down and our hosts, Phyllis and Jim Norfleet, sent us home with food!